A virus? Helpful? Most people wouldn’t think so. But Nicholas Muzyczka is working to prove that sometimes viruses can heal. Muzyczka is widely acknowledged as the world leader in the development of the adeno-associated virus (AAV) as a gene therapy transmitter. The UF laboratory Muzyczka directs was the first to show that AAV could be used for gene transfer. The researchers are currently collaborating with a number of other laboratories to gather information about the behavior of AAV in primary cells and whole animals, an area that has been mostly unexplored. They are also focusing on the improvement of current growth methods for manipulated AAV viruses, and are busy formulating the AAV delivery system. 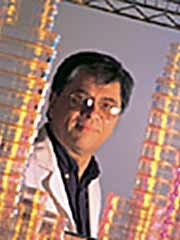 Muzyczka and his colleagues at UF were awarded a patent in 1992 for the use of AAV transduction vectors in their work.